Rockville, MD (June 16, 2016) – The first social network designed by parents for kids ages 5-12, KidMix, launched today. KidMix provides a new way for kids to connect with friends and to plan their own playdates all within a private, secure, monitored environment. KidMix is COPPA compliant and membership is free. 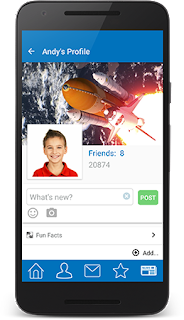 Children can use KidMix to connect with their classmates, sports teams, neighbors, camp friends, relatives and many more. KidMix allows kids to share their thoughts and photos, and message friends while parents monitor all activity using the integrated parent dashboard. Children will learn how to use social media in a safe positive way and will gain independence by planning some of their own activities while parents are able to simply accept, deny, or change them. By using KidMix, parents are no longer burdened with the task of coordinating a playdate for their kids, they just have to approve the request! Since KidMix is kidSAFE COPPA + Certified, all members are verified according to the FTC’s compliancy law for child online privacy protection. The robust parental ID verification process requires parents to verify their ID before they are allowed to create an account. KidMix is able to ensure that all members are not only who they say they are, but are using the platform with both parental awareness and permission. The registration process is simple, quick, and free. The KidMix App is available on iOS, Android, and Amazon. KidMix includes a proprietary Parent Dashboard that enables parents to oversee all activity and allows them to set parameters of how they want their children to use the network. As a social network, KidMix not only enables younger children to communicate and socialize with each other but they can also learn about a variety of subjects in KidMix’s SmartZone. The SmartZone includes thousands of curated videos kids can view and share with friends. KidMix membership is free and parents oversee all communication from friends, groups, photos, and invitations allowing for appropriate communication at all times. KidMix can be found at www.kidmixapp.com.